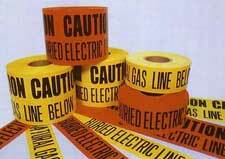 Color coded Underground Line Tapes quickly alert excavation crews to the existence of buried lines, cables or pipes. Available in 3" x 1000' and 6" x 1000' by special order. Tape Caddy also available for easy dispensing. Contact Customer Service. NOTE: Underground line tape should be installed 12" to 18" below ground level and 12" directly above the buried item. Custom legends, including Spanish, are available by contacting Customer Service.